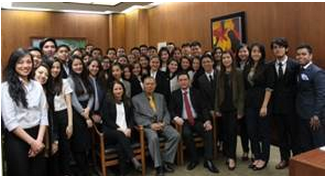 NEW YORK, 30 March 2015 –Student delegates from De La Salle University (DLSU), Manila and De La Salle-College of Saint Benilde (DLS-CSB) attending the 2015 National Model United Nations conference visited the Permanent Mission of the Philippines on 27 and 30 March 2015, respectively, to gain insights on the work of diplomats in the UN and on specific issues such as peacekeeping, environment, disarmament, among others. 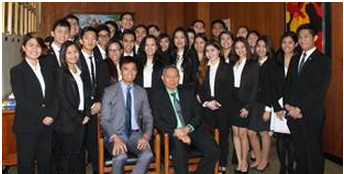 Minister Julio C. Dery, NYPM Chargé d’affaires, a.i., received the students. He was joined by NYPM Officers Ms. Noemi T. Diaz and Ms. Shirley L. Flores, and other committee experts.